Calves in a field of cornstalks. Looks a little barren, doesn’t it? 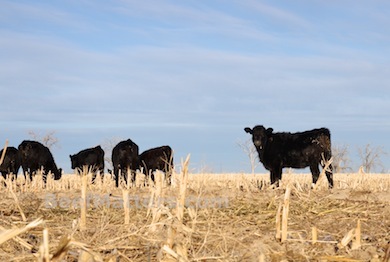 It’s surprising how well these calves do in a field of cornstalks. When the corn is harvested there is always some corn left in the field and that corn is like candy to these calves. In addition to the typical corn and barley that is fed to cattle, they will also eat many different types of crop aftermath (also called crop stubble). 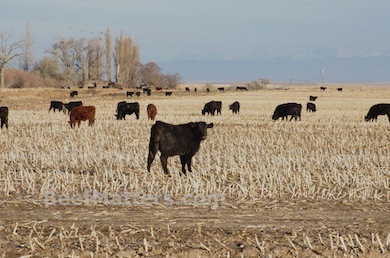 Here in Idaho, cattle are often seen in potato fields after the harvest. In different regions of the country cattle graze in carrot fields, cabbage fields and cotton fields. Usually the aftermath is plowed back into the ground, fortunately our neighbor leases his aftermath to us. Our calves enjoy the cornstalks and the field gets a little extra fertilizer! We supplement these calves with a little bit of hay and silage each day, but their main energy source right now is the corn stalks. Over the past week, another animal has moved into this field eager for his share of the corn. Hundreds and hundreds of ducks. My kids are fascinated with the ducks. As we drive down the road they are amazed at the number of ducks in the field and in the sky. Yesterday, we stopped to talk with a fellow who was pulled off the road right next to this field. He was a duck hunter. He was amazed at the number of calves in the field with all of those ducks! Here in florida cows get a lot of tomatoes hauled to the fields from the packing houses, I live in Ruskin where tomatoes grow all winter. also lots of oranges are fed to cows. It’s amazing what they eat, isn’t it? Tomatoes! I bet there are some red bovine noses in those fields! most of the tomatoes are green or a little pink, they are the culls from the packing house.